I met Zack Lo with Voodoo Circus. It was the 2009 Boston Fashion Week, and I had just moved to the city a few weeks before. I was hanging out backstage at a fashion show, outfitted for the runway. The bored get wary, and despite threats to stay in line, I strayed away to the make-up artists and hair stylists. The shoe designer Zack Lo wasn’t at the show, but his shoes would make an appearance that night. The manner in which the entourage of his people came, unloading bags of shoeboxes, and the petite models who looked like acrobats in their tights made an impression on the rest of the designers, models, and staff. There were a lot of questions whispered behind hands and sneaky eyes towards the shoeboxes. The collection was novelty and encouraged over-indulgence with its mix of materials and textures. The shoes demand attention, enlivened by big personalities that make them characters in their own right: Belladonna Boudoir, Safari Sideshow, Ringmaster, Piccadilly Tierra, Lipstick Zombie, Wandering Stars, Bumble Zoo, Black Magic, Pink Pony, Calliope, and Popcorn Diva. A few months after the 2009 Boston fashion show, I met up with Zack Lo to interview him for a magazine. He was still at the time promoting Voodoo Circus, but was already working to expand it into his Vintage collection, which was a psychedelic sugar-rush of shoe delight, as with the sequin Disco Carrousel-Retro, Velvet Pony Ride, and Hypnotique. Trends from his earlier collection developed in Vintage, like Bumble Zoo---one of their still most popular shoes. There was zebra print, and bumble-bee yellow against black and pompoms galore. A gluttony of lace, ribbons, tassels and bows name these rococo throwbacks, Contessa and Duchess. They beg to be slipped on and worn while eating cake. I didn’t make the formal acquaintance with Zack Lo shoes until another runway show, again for Boston Fashion Week. I wore La Stregha, a tiny stiletto with snakeskin detail, open-toe with patent leather, lace and zebra. Unless I’m walking the runway, I go for a low-heel, considering I live in Boston where one must walk to get around. But these shoes are so comfortable, when I got a pair for myself the other night and slipped them on, I thought, “Why not? Why can’t I walk miles in these shoes?” I probably could. The thing about Zack Lo shoes: they’re not for the tame, the prudent, the conservative. Meek in the workplace, just slip on a pair from any of his collections and you’re bound to feel a more daring. Inhibitions go away in these fierce, flashy confections of kaleidoscope materials and colors. The shoes will be remembered at the party, even if you aren’t. While his previous collections certainly have a place (fabulous nightclubs where they serve absinthe) and a demographic, his upcoming collection is for every woman. A bold modern punk style in pump shoes transforms office-wear into shoes for a fierce, gutsy kind of gal. Virago defines a type of assertive woman who isn’t afraid to speak her voice and won’t take any back-talk either. I sat down with Zack Lo to preview the collection, and he showed me the pumps which had hand-crafted heels. The gilded molded heels feature archaic figures like jaguars and faces, chimeras suggestive the transformative dynamism of the shoe. 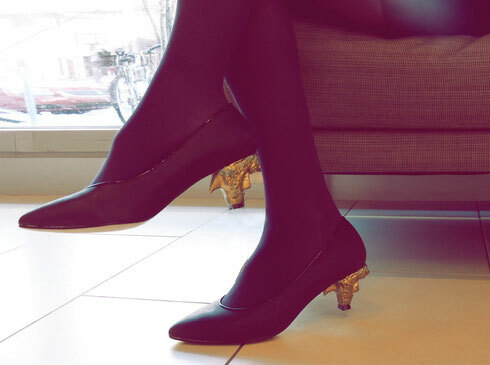 Walk into a board meeting and no one is the wiser to the lambskin leather pump. Walk away with a crazy, pre-Colombian hand-crafted heel and studded spikes embellish the back of the heel is a bit of power trip. Compared to Voodoo Circus, Vintage, and his Punk collection, the pumps and booties of Virago offer concentrated cohesiveness. 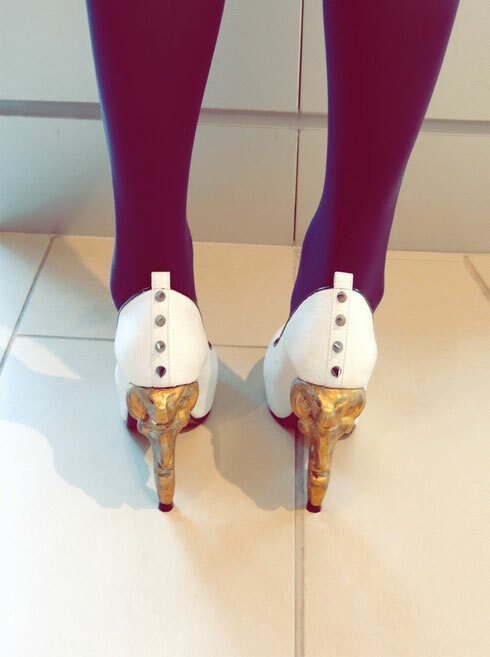 The shoes are domineering, but not overwhelming in detail. Because unlike Voodoo Circus which cries for attention, the edginess of Virago is understated, suggesting a strong, independent woman who wants functionality and versatility in her shoe. The glyphs and faces work their way into Zack Lo’s accessory collection, transcending history as they could be references to Mayan figures or Stonehenge ruins,. The gold metal bracelets echo the minimalism and boldness of the shoes. 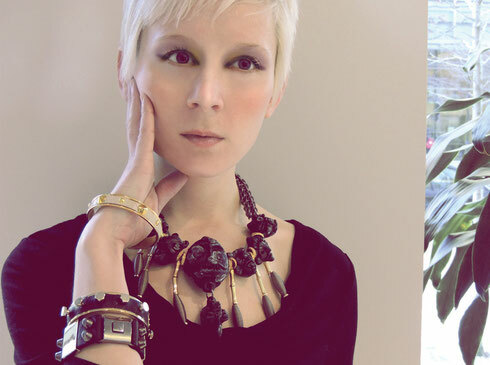 A bit chunky, the bracelets, necklace and earring are a hard-edge and sophisticated punk. As is the studded belt with metal tip that would wear well with a pencil skirt or any dress. The clutch bags are made with delicately soft lambskin, and can be scrunched up, roughed around a bit, folded, and slipped onto the finger thanks to the gold ring and three-faced charm chained to the zipper. And while the clutches are appropriate for nightlife and fabulous parties, the larger Spanish print shoulder-bags are suitable for the workwoman who needs to carry around her tablet or laptop. The larger bags, while very different from the small, black leather clutches aren’t punk at all, but their sharp lines and primordial pattern mimic the design, as well as the leather details, from the heels and accessories. The bright colors enliven the white and black tone shoes and accessories, taking femininity to the fierceness. What makes the collection so wearable, though, is the mixture of timelessness and unique elements with the basic pump style, the simple clutches and large shoulder-bags. The shoes, the accessories are functional and make the transition from day-wear to night-wear without being over-the-top or calling attention to the distinct designs. Shoes from Lo’s previous collections were provacative in the most obvious way: they combined all the elements and details like lace, animal print, ribbons, bows, bedazzles and pompoms galore that women love and men don’t really get. Lee Hershey is a freelance writer and contributes to Papercut Magazine and The Weekly Dig. Photos by Laura Dugdale and Zack Lo. Having read this I thought it was extremely informative. I appreciate you taking the time and effort to put this content together. I once again find myself spending a lot of time both reading and commenting. But so what, it was still worthwhile! I was extremely pleased to uncover this web site. I want to to thank you for ones time just for this fantastic read!! I definitely loved every bit of it and I have you saved as a favorite to check out new things on your web site. Hey There. I found your blog the usage of msn. That is a very well written article. I will be sure to bookmark it and return to read more of your useful info. Thank you for the post. I will certainly comeback. whoah this weblog is great i like studying your articles. Stay up the great work! You realize, many people are hunting around for this information, you can aid them greatly.